Legend said with the red mist came death. It had happened before, and now, it had happened again. This time, the death also brought Ramsey Clark to Buffalo Springs, Tennessee. She was from Raiker Forensics and was to help the team investigating the murder. The red mist had also brought the return of Devlin Stryker. As a parapsychologist, Dev had generally disproven claims of paranormal activities. Although there were those few times that he hadn't. This time, he had more at stake. This was his childhood home. He had many fond memories. There were not-so-fond memories as well, and the past had a habit of haunting a person when they least expected it. Ramsey had made it quite clear what she thought of Dev, and his being a "ghost hunter", but it was his innate charm with women that really irritated her. She wasn't able to talk with someone, but with Dev around, they were more than willing to provide the details that might be critical in her investigation. Even worse, though, was her own propensity to fall under his charm. Waking Evil weaves an insidious terror that will compel the reader to continue reading, only to find a new threat on every page. The idea of a hero "ghost hunter" was fascinating, particularly considering the heroine was grounded in evidence. There were several mysteries, in part due to the fact that the legend was founded on prior occurrences. Like all the women in the book, I too adored Dev, and it was fun watching him break through Ramsey's defenses. 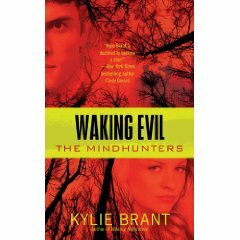 Although this is the second in The Mindhunters series, there was only a minor reference to Waking Nightmare, and stands completely on its own.